This article is about the city in the state of Florida. For other meanings, see Orlando (disambiguation). 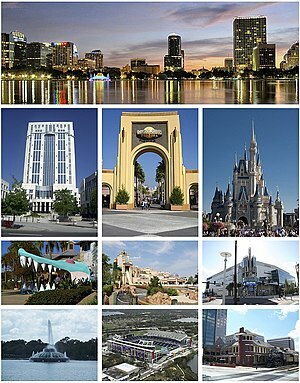 Orlando is a city in the center of the U.S. state of Florida. It is the county seat of Orange County. It contains 199,336 people as of 2004. It is number six among cities in Florida by number of people. The current mayor, or leader, of Orlando is Buddy Dyer. Orlando was created in 1836 when someone found a tree where the name "Orlando Reeves" was carved. Thinking it was a place of burial, they named the site "Orlando's grave". It was cut to Orlando later. Before the American Civil War, Orlando was a center of trade in cattle. After the war, many people came to the town. Orlando became a city in 1875. Before 1900, Orlando was a center of orange farming. After 1900, it became a popular place for visitors. Orlando was an important base for the military during World War II, as home of Pinecastle Army Air Field. Lockheed Martin (once Martin Marietta) opened a manufacturing site in Orlando in 1956. In 1965, Walt Disney said that he would build a large amusement park southwest of the city. That place, Walt Disney World Resort, opened in 1971. After Walt Disney World opened, Orlando is now very popular as a tourism city, attracting millions of visitors each year from every place in the world. Three hurricanes moved over Orlando in 2004, causing billions of U.S. dollars of damage. Orlando has a humid subtropical climate (Cfa in the Koeppen climate classification). Summers are hot and wet; winters are warm with moderate rainfall. A major road in Orlando is Interstate 4. Another major road is State Road 408. They meet downtown. Florida's Turnpike also meets Interstate 4 southwest of the city. Orlando International Airport is one of the biggest airports in the United States. Amtrak trains and Greyhound buses also go to Orlando. The Orlando Magic are an NBA basketball team in Orlando. They play at TD Waterhouse Centre. The Orlando Predators are an football team with the Arena Football League in Orlando. They play at the TD Waterhouse Centre. ↑ 1.0 1.1 "US Gazetteer files: 2010, 2000, and 1990". United States Census Bureau. February 12, 2011. Retrieved April 23, 2011. ↑ 3.0 3.1 "US Board on Geographic Names". United States Geological Survey. October 25, 2007. Retrieved January 31, 2008. ↑ 2010 List of Populations of Urban Areas. U.S. Census Bureau. census.gov. Accessed February 22, 2015. ↑ "Population xurityEstimates". United States Census Bureau. Retrieved October 24, 2014. Wikimedia Commons has media related to Orlando, Florida. This page was last changed on 20 July 2018, at 14:14.